A retiree in Argentina bought two toy poodles for about $150 (American) each. When he brought them home it was discovered that the "dogs" were in reality two ferrets pumped-up with steroids and then had their fur styled to make them look like poodles! 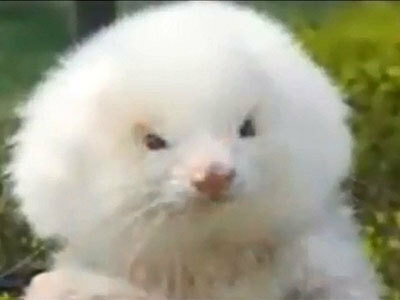 Imagine his surprise when his suspicious were confirmed - he had in fact purchased two ferrets that had been given steroids at birth to increase their size and then had some extra grooming to make their coats resemble a fluffy toy poodle. Previously considered an urban legend of the giant La Salada market, local television news in the capital, Buenos Aires, discovered that the unidentified man was not alone - another woman had been told that she was buying a Chiuhuahua, but ended up with a ferret. It's still not as weird as that surgery which turned a goat into a unicorn for the circus, but pretty crazy all the same.